An amazing alternative to fried chicken! Wow, I can't believe I haven't tried making something like this sooner! This is a two-part recipe...slightly time-consuming, but well worth it. 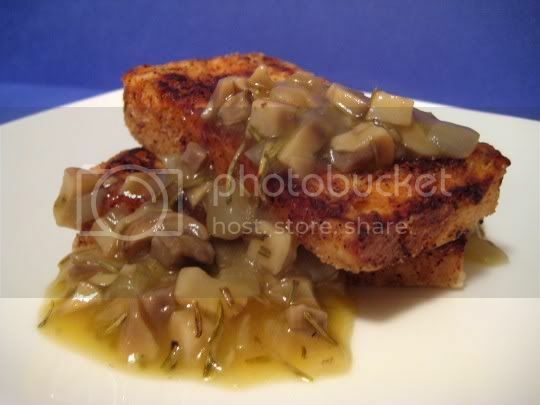 Start by making the mushroom gravy first: saute onions, rosemary, and mushrooms, then add vegetable broth and simmer. (Right before serving, whisk in cornstarch to thicken up.) While the gravy is cooking, prepare the herb crust, which is a mixture of cornstarch, salt, pepper, Italian herbs, garlic powder, and a little cayenne. Coat pressed tofu slices in the mixture, and fry in a shallow skillet (I used my cast iron, fun!) about 5 minutes each side. You will get a crisp, crunchy, wonderfully flavored crust that isn't too thick or greasy (the slices do need to be drained on paper towels), surrounding delicately flavored tofu (use the extra-firm kind). I still can't get over how delectable this dish is! The crispy tofu is salty, peppery, herbal, and garlicky. Top it with the earthy, savory gravy, and you've got such a winning dish...you may even be able to convince meat-eaters! This is best served right away; the crispy, crunchy crust of leftovers (as with most fried foods) doesn't fare too well.